Blisters & Socks: Is There a Connection? We’re experiencing a burning sensation under foot is what we’re doing, specifically on the balls of our feet. This wasn’t mentioned in the song lyrics*, nor as a side effect on the app/tracker/wellness program we signed up for. But there’s only a quarter mile left, so it’s all good. Apparently, there is a direct correlation (or link) between the socks you wear and the blisters on your feet. Everybody knows about blisters. They are the small sacks of fluid that rise up in defiance when you are doing something different than normal. They are the result of badly fitting shoes. They are monstrously uncomfortable and can really put you off your new routine. They are also created by the application of friction on your foot. This force, friction, can actually cause the outermost layer of skin to separate from the other inner layers leading to a sack that the body then fills up with fluid. Wearing thin or cotton socks in particular can make this frictional phenomenon worse, because these socks absorb all the sweat. This leaves no lubrication for the foot to work with against your shoe. “Blisters can easily be treated and prevented. The key to increasing the distance you walk, jog, or hike without getting blisters is to give your feet a way to absorb the friction created when they rub continuously against another surface,” says Podiatrist Ryan Rushton, DPM. Reduce friction by rubbing an antiperspirant or petroleum jelly across the areas of your feet that rub against your shoe. Use friction-reducing socks, made of materials like PTFE or nylon. Reduce moisture by putting talcum powder or cornstarch in your shoes or socks. Reduce heat by allowing your feet and shoes some break time to cool down. All of these options give your feet a way to absorb the friction without causing that horrible squishy aftereffect. Who knew, right? They never covered this in home economics or P.E. 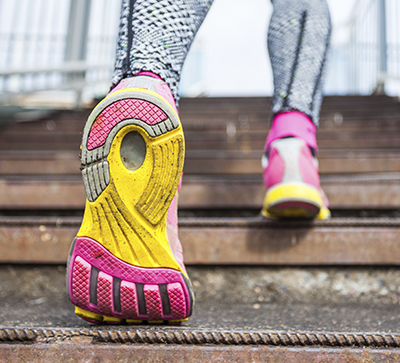 The good thing is you are now prepared to go the distance—but maybe work up to those 10,000 steps! *Opening paragraph inspiration provided by Cake’s lyrics for the song “The Distance.” While we cannot endorse any particular product or brand, this blog writer suggests musical accompaniment by the alternative group Cake is highly motivating while on the course.